Jan Gunneweg is very much ‘into wood’. And not just in a tree hugging sort of way. The Dutch industrial designer creates all sort of implausible things from timber. His latest (and greatest) is an all wooden bike. 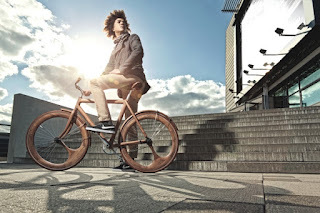 Pretty much everything you see in the photos is made from wood – and that includes the asymmetrical wooden wheels. Tires aside, this thing is 95% wood. And the rest is space age technology. There’s no price on Jan’s website (and it's not in English! ), but given the 200 man-hours he spent carving this out of tree trunks it’s not going to be cheap! Legendary furniture designer, Philippe Starck has done it again with the D'e Light lamp. 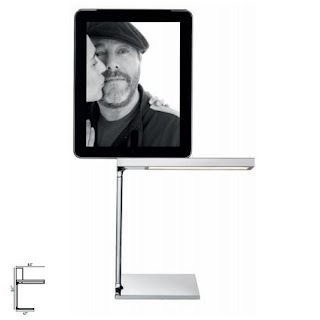 Complete with a dock compatible with ipad, iphone and ipods, the lamp has a top surface where you can place your electronic accessory for use. D'e Light has a radical, extremely functional, very Starck design. With a USB socket above the light diffuser, the cool chromatic sophistication of the aluminum, the efficiency of a light source with a remarkable twenty eight 3000K top LEDs and compatibility with various types of digital gadgets, the D'e Light lampis perfectly attuned to our contemporary habits. 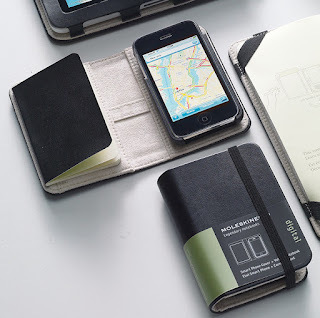 The Moleskine Smart Phone Cover is compatible with the Apple iPhone (3G and 3GS models) and melds paper, phone, and internet for a cool and compact, portable workstation. It protects your precious iPhone against impact and scratches, while providing a convenient place to take (old school) notes in the accompanying plain Volant Notebook! Gonçalo Mabunda is interested in the collective memory of his country, Mozambique, which has only recently emerged from a long and terrible civil war. 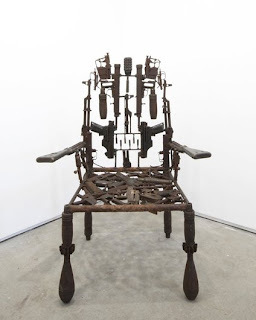 In his sculpture, he uses AK47s, rocket launchers, pistols and other objects of destruction to create striking Modernist sculpture and furniture with a Picasso-like edge. The deactivated weapons of war carry strong political connotations, yet the beautiful objects he creates also convey a positive reflection on the transformative power of art. Thanks to Jack Bell Gallery for this post. These unique ottomans nest inside each other and are slipcovered...perfect for dorm rooms. Simply nest the small and medium ottomans inside the large to maximize space in any room. They are designed to be enjoyed as ottomans or functional extra seating. The slipcovers have elastic on the underside for a snug fit and can be easily removed for cleaning. When you want to change your style, simply change your cover. From our friends at SIS. We just got these in and they are so cool! The ergonomically awesome WorkPad can work as a mobile freestanding desk at home or in an office, and moves silently up and down in seconds, effortlessly, with one hand tied behind your back! 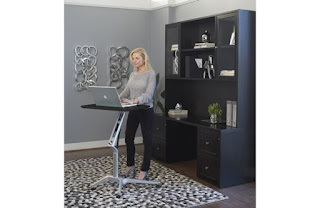 Now you can work sitting or standing. Which has been proven to be very healthy. Stop in and say you saw our blog. We'll give you a great deal! The Vegetable Light is a little table lamp that uses a large heavy vegetable as a base. Rather than buying a vegetable for its edible potential, the sculptural form and functional qualities are emphasized and the owner is invited to experiment creatively with different vegetables. Yams tend to work best. 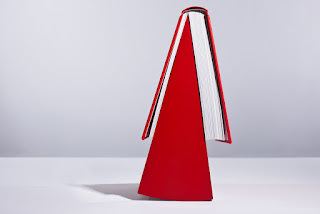 The lamp was created by Peter Marigold, a furniture designer working in London. 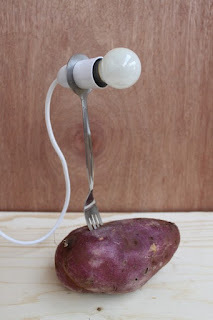 For more lamps (without the potatoes)...click. We love cars. We love cool design. 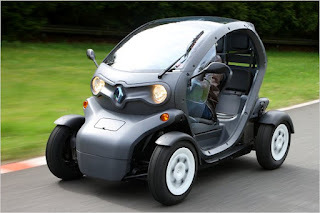 We really love the new Renault Twizy. A small two-seater urban vehicle and 100% electric propulsion is an interesting solution to sustainable urban transport. The cabin can accommodate two occupants in tandem arrangement, one after the other. Powered by a lithium ion battery, Twizy offers peppy acceleration and a maximum range of 62 miles. Not available in US...yet! Paola Petrobelli was born in Padova, and trained as a molecular biologist. 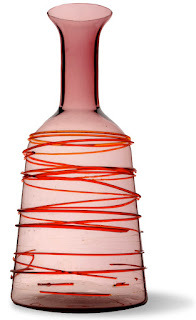 She moved to London in 1991, left her high level medical research to become a glass designer in 1999. Collaborating with different Murano glass makers since her beginnings, Petrobelli works in simple, rigorous and sensuous shapes which she combines with her sophisticated use of colours. She rejects the purely decorative glasswork in favor of functional objects such as floor or table lamps, suspensions, tableware and vessels. Like BOTTLE. A very simple symmetrical shape that was blown using different techniques in a variety of colors. 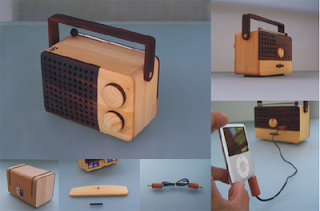 Inspired by the iconic form of a portable radio : round knobs, speaker grill, handle, telescopic antenna and the battery case, designer Singgih S. Kartono, combine dark & light colored woods to create a new wooden radio with a retro design shape and line. Works as an old school radio or connect music player/Ipod speaker. Tanya Aguiñiga is a Los Angeles based furniture designer/maker raised in Tijuana, Mexico. Tanya’s work encourages users to reconsider the objects they use on a daily basis by creating work that explores an objects’ unseen aspect. 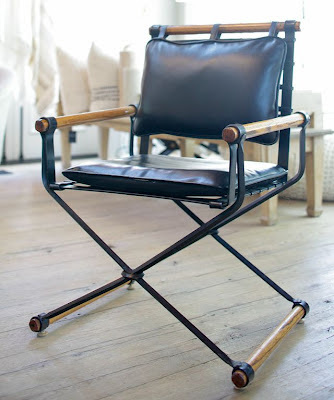 She took the generic metal folding chair and made it absolutely sublime. 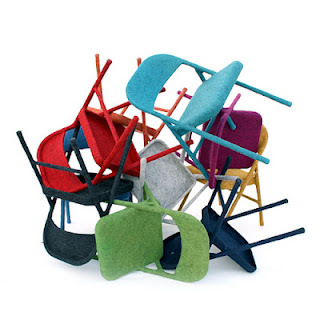 After 30 hours adding brightly colored felt to each seat by hand, the results add a sense of texture. She also makes whimsical felt creatures we love. This is clever. 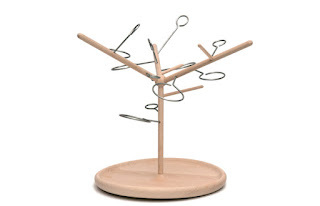 The NEW WorkPad from Jesper Office can work as a mobile freestanding desk at home or in an office. 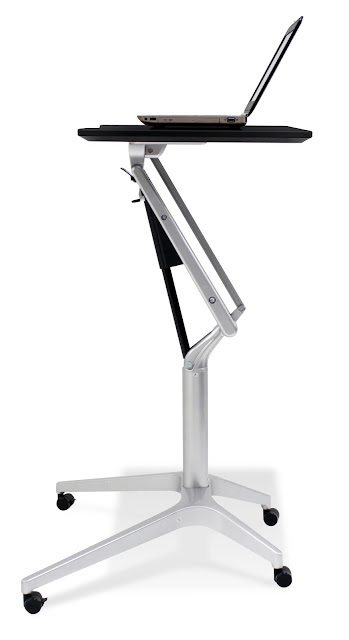 Moving silently up and down in seconds, it allows you to make the transition from seated to standing position heights so that you can stretch your legs while you stretch your mind. We saw these in High point and ordered immediately. Coming soon! Dwayne Lawler's inspiration for Shapedwood Lights was simple enough. The quality of the sunlight shining through the leaves in a forest. With a source of backlighting, combined with small, randomly-shaped pieces of scrap wood at various angles produces a similar effect. Such light creates an ambiance which is comforting and secure. Shapedwood lights are unlike anything we’d seen – fresh, energetic, inspiring. We love fresh, energetic and inspiring! Cleo Baldin is an American furniture designer who made these fabulous campaign chairs in the 60′s. 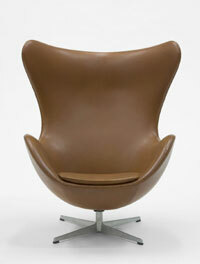 Made of iron, wood and leather these chairs are extremely chic! They go for $2,200 each. Or check out the slightly less expensive version at dane decor. Our Nomad Chair is under $300! Check out UNIQUE fabrics, a company with a passion for beautiful textiles sourced from around the world. 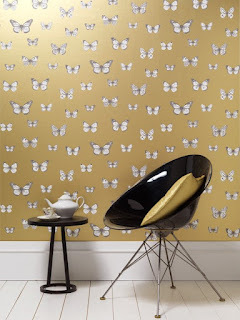 They use fresh effects, soft textures, and delicate, dusky colors in a broad range of fabrics, trimmings and wallcoverings to create exquisite designs with a contemporary edge. Whew. A neat juxtaposition with modern furnishings from yours truly. 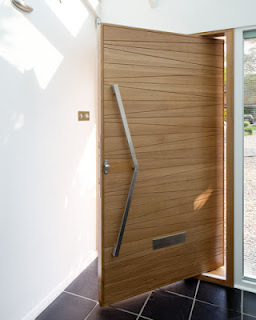 The modern home needs a modern door. Urban Front is run by a young enthusiastic team of designers with a passion for high quality doors, materials, and design. Each doors is meticulously made and produced from natural hardwood. We love these doors! Click here for video. Lékué began its journey in the 1970’s with its first rubber brooms andice-cube trays. Functionality, quality, innovation and avant-garde design constitute the basis of Lékué’s philosophy and they continue to develop new surprises. 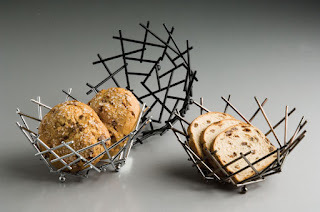 Innovative designs from innovative materials in order to create attractive products for the home that are both easy and comfortable to use. Sounds familiar! Clever. Fun. Functional. 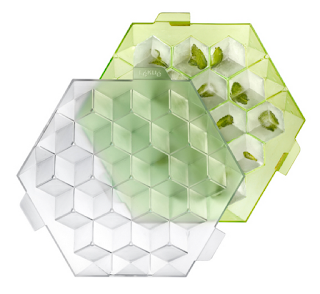 We love Fruit Boom designed by Laurens van Wieringen. Fruit Boom brings back the origin of fruit on living room table in a playful and decorative fashion. Fruit Boom is an excellent example of combining the joy of picking fruit and toying with the origin. Beechwood and Stainless Steel.